REGISTRATION NOW CLOSED for Invitational #1. You can still pre-register for Invitational #2 which will begin sometime in February 2012. Registration for the tournament is now open. Please review the rules below and click the link to register online. Registration will close after a certain timeframe that we determine or when we receive the max number of entries. Tournament is first come first served. Registration does not guarantee entry. If a registrant does not make it into this tournament they will be given first right of refusal for our next tournament. This is a single elimination tournament in bracket format. Each player must submit a screenshot at the start of the game, to be eligible for the next round. Winner of each round must be decided within 72 hours from initial play. In the event of a tie, the player that “goes out,” playing all tiles first is the winner. (Even though this player is technically the “Loser” according to the official Words With Friends rules and game play. Winner of each round must submit a screenshot of the completed match within 72 hours from the time of the initial word being played. Winner of each round will advance to challenge the winner of the corresponding bracket. 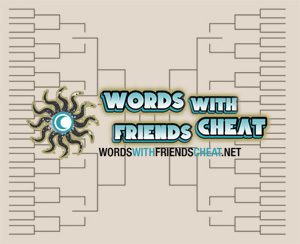 Each bracket winner and eventual champion will be declared on wordswithfriendscheat.net and the Tournament Facebook page. All rules are enforced by the honor system. Conflicts will be determined by Words With Friends Cheat Tournament Admins and may results in both players being eliminated, if they cannot come to an agreement on their own. OUTSIDE HELP – Outside help should be relegated to our Words With Friends Cheat Generator or Words With Friends Dictionary. It is not required to use our generator or dictionary to create your words, but to ensure a level playing field, everyone is allowed and encouraged to use it. What is not allowed is any hack on any platform that allows words to be played that are not in our dictionary or the official Words With Friends dictionary. Anyone who is caught using a hack, will be immediately eliminated. POST OR FORFEIT – If a winner is not determined within 72 hours of the initial word play, both participants will be instantly eliminated and the opposing bracket champion will receive a “BYE” to the next round. The way in which a winner will be determined, should the game go incomplete is current score leader at the end of the 72 hour window. A screen shot of the game state must be submitted by the winner, determined in this manner, and may be subject to confirmation by the losing player or both players will be eliminated. TIME FRAME – Both players need to communicate before the start of the game, as to when they will be able to play. Are you an early morning player, late night player? Tell your opponent when you are normally online and available to play. If you have to take a prolonged break, once you have begun, please notify your opponent via the chat feature. If a conclusion has not been reached for that round during regulation time, then the player who has been waiting can record the round as a loss – indicating in the e-mail with their screen shot whether it was a “no show”, “forfeit” or “time ran out”. NO SHOW – Turns should taken as soon as possible (ASAP). If a player does not play for a prolonged time without notifying the opponent, and an attempt to reach the player goes unanswered for 24 hours, an e-mail with a screen shot should be submitted with a brief explanation of the no show. Screen shots of any chats or saved e-mails should be included, to document the no show. A legitimate attempt to contact the player must be made though. ONE PLAYER – You cannot enter the Invitational tournament as more than one player, using multiple screen names. If this is discovered, the result is instant disqualification of both entrant names. 24 HOUR FORFEIT RULE – If a player refuses to make a move for one full day (24 hours) without any prior arrangement with the opponent, the round can be claimed as a win by forfeit. An accompanying screen shot, showing a full day without movement must be provided. The choice is made by the opponent and subject to confirmation. DISPUTES – Reversal of a match will only occur with proper documentation. If a player feels that he/she lost due to unfair treatment by an opponent, the result can be disputed. An e-mail with screenshots, chat or e-mail transcripts with an explanation can be sent to : [email protected]. Only in the blatant and well-documented cases will a decision be reversed. The chances of this happening are slim, but will we review each complaint. GOING FIRST – The player that goes first in each match will be determined by random seeding order. This player must initiate the game request. COMMUNICATION – We have zero tolerance for profanity, bullying, obscene/crude remarks, racism or intimidation of any kind. Any player that breaks this rule will be banned immediately, no exceptions. TIES – If the game results in a tie, the player that “goes out,” playing all tiles first is the winner. (Even though this player is technically the “Loser” according to the official Words With Friends rules and game play. Legal conditions: All federal, state, and local laws and regulations apply. Words With Friends Cheat reserves the right, at its sole discretion, to cancel, terminate, modify, or suspend this contest or any portion hereof, to disqualify any individual at any time or determine the winner of any round. 2. If a player is caught using a Words With Friends hack that allows non-valid words to be played. 3. The App or any website associated therewith (or any portion thereof) becomes corrupted or does not allow the proper processing of entries per these rules. 4. The contest is for any reason not capable of running as planned by Words With Friends Cheat staff. By entering, each participant agrees to release and hold harmless Words With Friends Cheat website owners, staff, administrators or any involved in the maintenance or management of the tournament from and against any and all claims, actions and/or liability for any injuries or death, loss or damage of any kind arising from or in connection with participation in and/or entry into the Contest or acceptance or use of any prize. 1. Glitches, downtime, bugs, defects, delays, crashes, errors, omissions, interruptions or any other issues with the Words With Friends app on any device or website. 3. Entries, updates or winning declarations which are late, lost, stolen, damaged, illegible, and/or unintelligible (or any combination thereof). The use of third-party software or website or automated entry systems to participate is prohibited, and Words With Friends Cheat reserves the right to disqualify entries made in such fashion. By entering, each entrant agrees to comply with these Official Rules. Any entrant who attempts to tamper with this Contest/Tournament in any way shall be disqualified. when does it start? i’m bored nobody to play with. i wanna play someone, when does this tournament start? I think I could at least go 1 or 2 rounds or maybe more.